You'll love the homespun look of our Wire Three-Tier Hanging Basket and the way it adds an Americana splendor to your kitchen decor. Crafted of a chrome plated steel, with a rust resistant finish, this attractive holder is great for storing fruits and vegetables. Clearly display the fruit in the basket; keeps fruits orgnanized and allows air to enter and circulate freely. Approximate Dimensions (in inches): 12.25 W X 32 H X 11.75 D.
RUSTIC 3-TIER RACK: A wall-mounted storage rack made of rustic-style metal wire with a dark brown finish. WALL MOUNTED SPACE SAVER: Mounts easily to wall to instantly add organization and storage capacity in the kitchen, workshop, laundry room or closet. 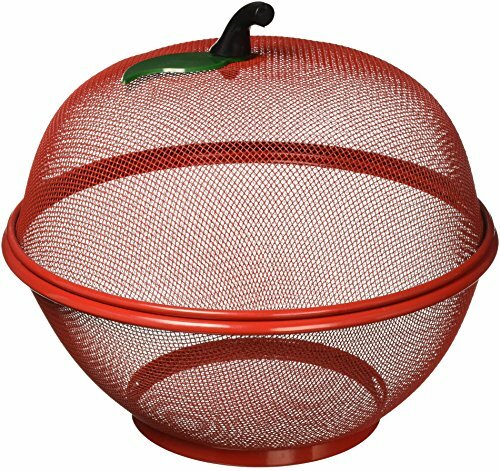 This decorative wire-mesh apple shape basket safely stores and displays fresh fruit, all year 'round. It adds beauty to your tabletop or counter and keeps insects away from your fruit. Crafted in iron with a rich red finish. Hand wash. 9 1/2" dia. 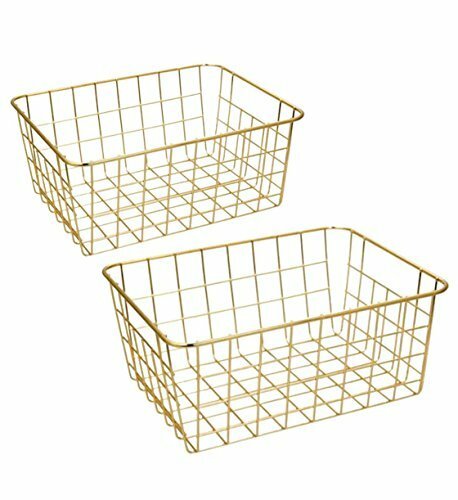 x 10"H.
Gold wire baskets, sturdy, multiple uses. 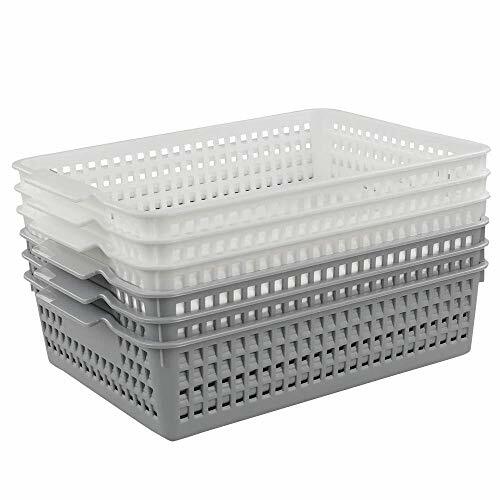 Store bathroom items or use in office. They fit nicely in a kitchen wall cabinet. 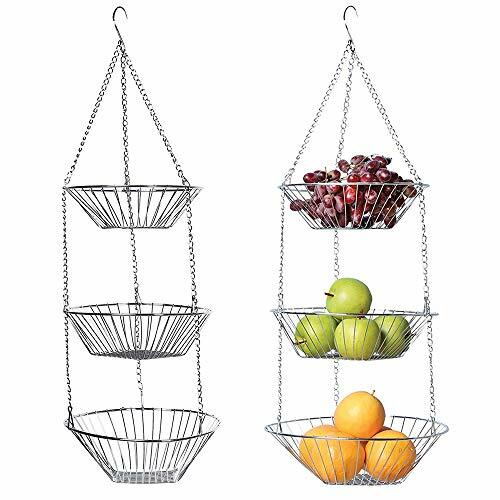 Wire basket help organize your home. Gold wire baskets, sturdy, multiple uses. Store bathroom items or use in office. They fit nicely in a kitchen wall cabinet. 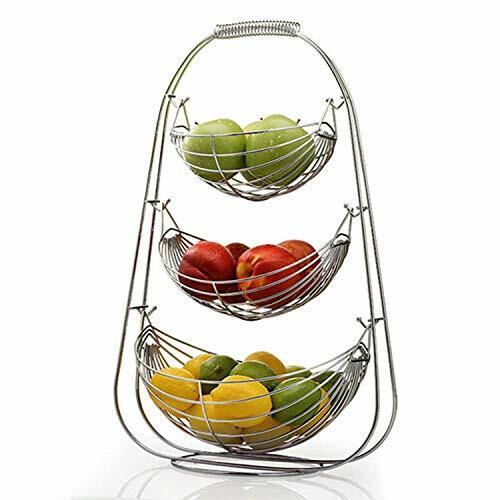 3 Layer Hanging Fruit Basket : the open design helps fruits and vegetables to ripen evenly, the 3-layer fruit basket has large space to store fruits, and you can hang on the basket on the wall, convenient and portable. Easy to Disassemble : The fruit hanging basket can be detached according to your needs. You can detach it into a hanging basket with one layer, two layers, or three layers, or it can be used as a fruit tray. Solid & Robust : The fruit basket is made of stainless material, durable and beautiful, and keeps the fruits clean and dry. 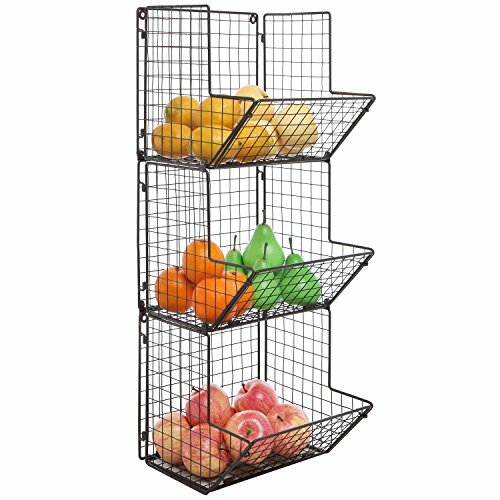 Great Decoration : ideal for adding convenience to your kitchen or any room, displaying your fruits and vegetables in your kitchen, or filling it with anything else is worth presenting for an elegant feel. Application : for the kitchen, utility room, bathroom, restaurants, living room, shops, supermarkets and so on.